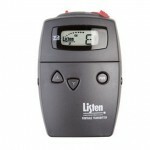 The Listen LT-700 Portable Display RF Transmitter is used to wirelessly broadcast audio for a variety of portable applications. Whether its voice or music, you can broadcast your audio to everyone in the audience without having to carry a microphone or be plugged into a wall. The LT-700 is excellent for factory tours, outdoor events, wireless microphone applications, classrooms, training, or personal use - anywhere you need to amplify sound, but don't have (or want) an installed system. With the many features of the LT-700, portable transmission has never been easier for users! This product is approved by the FCC for use in the US. Please note that they cannot be used in all countries. Check with your local government or specific regulation with regard to broadcast frequency in your specific country. Note: FCC rules limit the use of this product to assistive listening. The portable RF display transmitter shall be capable of broadcasting on 57 channels. The unit shall incorporate a microphone sensitivity switch. The device shall broadcast on both wide and narrow band channels with a SNR of 80 dB or greater. The device shall have an audio frequency response of 50 Hz to 15 KHz, ‘±3 dB at 72 MHz, or of 50 Hz to 10 kHz, ‘±3 dB at 216 MHz. The device will incorporate a mute switch. The battery door shall be capable of being mechanically locked. The device shall incorporate an LCD display that indicates channel, battery level, low battery, battery charging, and RF signal strength. The portable transmitter shall incorporate automatic battery charging circuitry for recharging of NiMH batteries, with the ability to charge via a wall transformer or drop in charging case. The Listen LT-700-072 or LT-700-216 is specified. Q Can I have multiple transmitters operating in one facility? A Yes. You can have multiple transmitter operating in one area on different channels, however more than one transmitter cannot be used on the same channel. A Yes. Listen offers the LA-263, a mic/line input cable for this use (72 MHz). Q Does the LT-700 provide phantom power? Q Will the LT-700 portable transmitter work for two-way communication? A No. However, Listen does not recommend a two-way system for tour group applications. A two-way system means that everyone hears every sniffle, cough, comment etc. The tour guide loses control of the tour and the tour becomes unproductive. A Alkaline batteries last 15 hours; NiMH rechargeable batteries last 15 hours (72 MHz & 216 MHz). With 863 MHz, Alkaline batteries last 8 hours and NiMH rechargeable batteries last 8 hours. Q What is the range of the LT-700 portable transmitter? A Line of site up to 150 ft. (45.7 m) for both 72 MHz and 216 MHz. Line of site up to 200 ft. (60.9 m) with 863 MHz.